Braising is such a satisfying process; it’s almost like deep frying–you can deep fry anything and it would taste good. You could probably braise anything and it would taste good. Except for maybe liver. Nobody likes liver. Pogi doesn’t even like liver. Then again, Pogi doesn’t like anything that isn’t Tuna or Science Diet. But you can’t just dump something into a braising liquid and walk away. Braising is largely about building flavors, and then allowing those flavors to slowly transform your food into something spectacular. Braising is a method of moist-heat cooking in which the item being cooked is covered or partially covered and left to simmer over a period of time. Think pot roast. When people think of braised foods, they generally think of tough proteins–pork shoulder or brisket, because heat, moisture, and plenty of time help break down collagen, the tough connective tissue found in meat–but you can braise most foods, though I wouldn’t necessarily recommend it. Stick to some of the more tough, fibrous proteins, but don’t be afraid to braise artichokes, root vegetables, or chicken. Braising require a liquid, and water is an easy and practical choice, but if you want to really punch your food in the mouth with flavor, try using various broths and stocks for depth of flavor. And this is where things really get fun. I love building flavors when I cook. Braising allows you to build flavorful sauces with any number of ingredients. Vegetables are a great source of flavor, and that’s where we’ll start with this recipe. 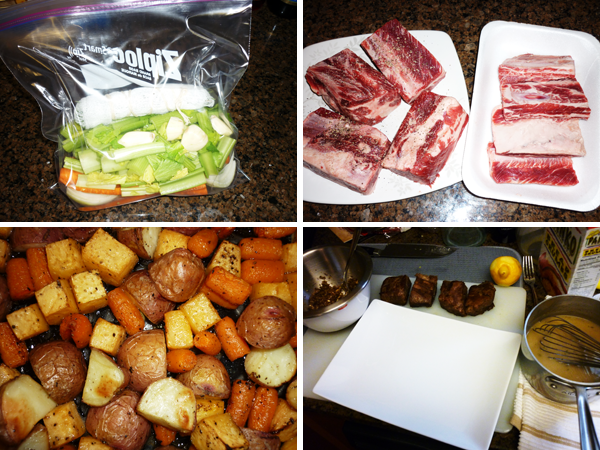 One of the great things about braising is how simple and quick it can be to prepare. If you’re like me, then you constantly wish you had line chefs to which you could just delegate all the prep duties. Luckily, you’re just going to throw all these ingredients into a pot, so who cares how well you chop the onion or how even each carrot turns out? It doesn’t matter! Just chop’em up and throw’em in. You can prepare this meal the night before, stick it in the fridge, and throw it all together in the slow cooker as you walk out the door for work that morning. In fact, that’s exactly what I did. If you look at the picture above, you’ll see that I cut all the veggies, prepared the sachet, and sealed it all up in a ziplock over night. I also trimmed the meat and stored that in the fridge as well. Usually I don’t cut the bone out of the short rib–it has so much flavor; I removed the bone this time around so I could more easily trim the fat (sometimes the fat can be cumbersome to remove after cooking due to the tenderness of the meat, so it’s best to remove it beforehand). Combine all the ingredients into a slow cooker large enough to fit all the ingredients (we have a 6-quart slow cooker, which fits everything comfortably; if you’re using a 4-quart container, you will probably have to scale the recipe back a bit). If you don’t have a slow cooker, you can easily throw this in a pot large enough to hold all the ingredients and cook it in an oven (275F for 5-6 hours). Turn your slow cooker to low, cover, and let it go for at least 5-6 hours. I prefer to give it a good 8-10 hours to really let the meat absorb flavors and become fork tender. If you plan on doing this before work like I do, then by the time you get home all you’ll have to do is prepare the veggies and dinner will be ready. *Generally, when you braise meat, you should sear all the sides before placing it in the braising liquid. This provides a great additional texture, but it isn’t necessary. If you’re doing this in the morning before work, you probably won’t want to fuss with that. I actually braise the short ribs, season them with a little salt and pepper, then sear them quickly after the braising process. For additional texture, I also torch the the corners and center surfaces (if you don’t have a blow torch don’t worry about it, searing the outside is most important). A gremolata is a chopped herb mixture generally used for garnishing a protein. Italians sprinkle this over meat dishes, the most common being a veal milanese or ossobuco. A basic gremolata almost always includes parsley, lemon zest, and garlic, but you can get creative and create your own gremolatas. For this recipe, I start with a base of parsley and bread crumbs and build from there. In a small bowl combine all the ingredients except for the vinegar. Stir to combine well and then slowly add the vinegar. The crumbs will absord the vinegar quickly, so stir constantly in order to get as much of the crumbs coated with the vinegar as possible. Slow roasting root vegetables is as easy as it gets. Preheat your oven to 350F. Wash and peel your vegetables (if you like the skin on your potatoes, feel free to leave the skins on, but peel the turnips and carrots). It is important to cut your vegetables roughly the same shape and size as the other vegetables, in order to ensure each piece cooks evenly with the rest. The carrots will be tricky, because of their odd shape in comparison to the other vegetables (parsnips as well, which I don’t use here, but would also be delicious to add). Use the larger ends of the carrots and save the smaller ends for something else, because the small ends will likely become overcooked and eventually burn (store in a zip lock back and eat carrots as a healthy snack later in the week; besides, bagged baby carrots are far more expensive then the loose bunch carrots at the store–it’s a win-win situation). Place your chopped vegetables in an oven safe dish, such as a pyrex dish or even a cookie sheet with quarter-inch walls. Drizzle olive oil over the vegetables and season with salt and pepper. Stir the vegetables around to make sure each piece is lightly coated with oil (don’t go overboard with the oil, you don’t need to drown them). Add the sprigs of rosemary and thyme on top and let cook in the oven for at least and hour and a half. If you have plenty of time, cook them at a lower temperature for a longer time period (slow roasting vegetables like this brings out their natural sweetness). Cooke until the vegetables are fork tender. Discard the rosemary and thyme when done (you can crush the thyme over the vegetables if you want the additional seasoning, but I like the natural flavor and sweetness of the vegetables on their own). Pile a small amount of root vegetables in the center of the plate (if you’re using rectangular plates like I do, then pile them off to one side). 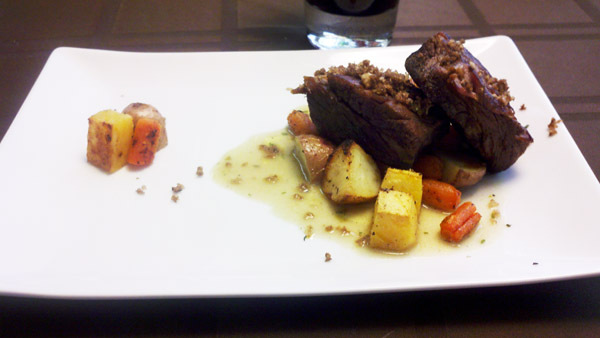 Place one short rib directly on top of the vegetables, and place another short rib leaning against the first short rib. Take 1 piece of carrot, potato, and turnip, and place them on the opposite side of the plate if you’re using rectangular plates. If not, skip that step. Ladle a small amount of the braising liquid directly over the short ribs (I prefer to reduce some of the braising liquid with a very light roux to create a slightly thicker sauce that won’t run all over the plate, but some people like the flavor and texture of the braising liquid as is; in the above picture, the bottom-right corner picture shows a pot of the reduced braising liquid that has been reduced, whisked, and thickened). Garnish the meat with the gremolata and serve. If you want to add a little color, feel free to add a sprig of parsley on top of the short ribs. This is one of my favorite recipes for it’s rich flavor and sheer simplicity.